Kent, Connecticut — Today, the Chief of the Schaghticoke Tribal Nation (STN), Richard Velky, testified before the Connecticut General Assembly’s Public Safety Committee, urging legislators to amend Senate Bill 357 (An Act Concerning Gaming). During his testimony, Chief Velky asked the committee to “keep focused” on the bill’s stated purpose, which is to amend and correct the State’s bingo laws. “To us, tribal gaming is about creating an economic opportunity for an impoverished people and if we were permitted to pursue gaming, we would use that opportunity to create jobs for us and for the surrounding communities,” added Velky. 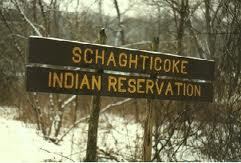 The Schaghticoke Tribal Nation is one of the oldest state-recognized tribes in the U.S., formally recognized by the Colony of Connecticut in 1736. Read Chief Velky’s full testimony here.